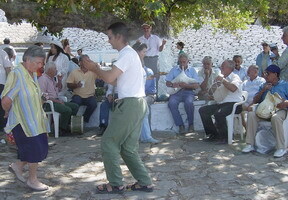 The island of Kea in the Cyclades is known for having some of the best traditional musicians in Greece. In the summer of 2003 some of them came together along with others from the islands of Naxos and Syros for a weekend festival of singing, playing, dancing eating and drinking. The festival is held in a variety of locations. Some nights found the musicians in the local tavernas. There was a picnic at the Fountain of Benjamin beneath the large platanos tree where farmers sit in the shade while their animals drink. The final night there was a concert in the Platia in Ioulida which was preceded by a film on the music of Kea, in particular the Tsambouna, the instrument that is the star of the festival. What exactly is a tsambouna? It is the skin of a goat with all the orafices and legs sealed except for two. One opening is a mouthpiece and the other a horn, also from a goat where the sound cmoes out. The sound of the tsambouna is something like Scotitsh bagpipes with notes being played over a mournful droning that sounds like cats in heat until you get used to it when it begins to sound mysterious and magical. 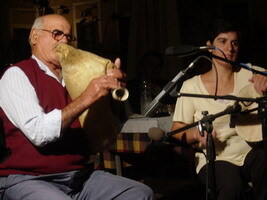 The various tsambounas (and related flutes and pipes) have been played on the islands of Greece for at least a millenium, some of them in what is now Turkey. There is purely instrumental music for this bagpipe, though it is also played in accompaniment to songs. On many islands a smallish two-headed drum held with a strap around one shoulder and struck with straight sticks (toumbaki) is played with the tsambouna. I have seen such sticks made of ram's horn and ornately carved by the owner. The skins used for the bags of these pipes and for the drum heads are usually from the torsos of goats, and the pipe reeds are made of a kind of cane. These are shepherds' instruments which were banned by the dictator Metaxas in l936 as being 'backward' as well as by the 'junta' (a military dictatorship backed by the CIA from 1967-1974). When presenting a concert of holiday music from all over Greece with musicians a few years ago, my partner and I were told that though the pipes could be played for pupils in the schools where we also gave musical presentations, they could not be played in the large Orthodox church where the concert was to be held. 'Why not?' we asked, and were told that the tsambouna was considered a 'street instrument'. One can only wonder at the deeper reason, perhaps having more to do with the pagan times that preceded Christianity. Instruments so obviously made from animal skins suggest a connection with the earthly realm as no others do. 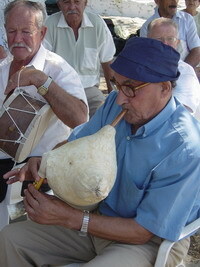 The tsambouna (and, in some islands, tsambouna and toumbaki), though still played, are heard less often in recent times than the violin and laouto on most Greek islands. They are played especially at Apokries (the Greek version of carnival), where pre-Christian forms of revelry are still observed, including the wearing of animal skins and large belts of heavy goat-bells. 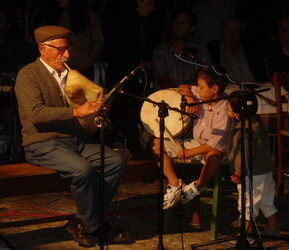 Most tsambouna players in Kea are farmers and shephards whose musicianship can go back for generations. There are also a number of city-born tsambouna players who have embraced this instrument and come to the island's festival as something of a spiritual soujourn just like the rembetologists who come to Hydra for the yearly Rembetika Festival. The tsambouna resembles a bagpipe with single reeds, consisting of two parallel cylindrical tubes (made out of carefully selected cane) inserted into a single block of wood through a horn-shaped opening. The bag is made out of kid which after a certain process well known to the players of tsambouna, is turned inside-out and made waterproof and leakproof. This process involves the use of chemicals as well as natural materials, such as honey, milk, and oil. 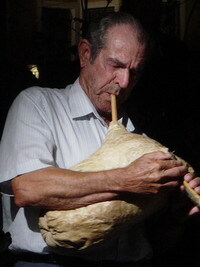 This type of bagpipe is morphologically similar to the instrument found in Crete and others seen in the Balkans and the Middle East. 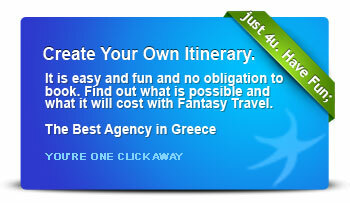 However, the way in which the notes are produced is more unusual and, in fact, unique to the Dodecanese tsambouna. As such, it cannot be classified among either bagpipes with a fixed drone nor those which are solely melodic. In fact, the right pipe completes the hexatonic scale and can, at the same time, find itself in unison with the second degree of the scale, thus covering both melodic and accompaniment functions. The tsampouna�s tuning system possesses qualities which are completely particular, of which the most obvious is the tonal "ambiguity" of the third degree (in relation to the lowest note of the scale). As I said before the tsambouna takes some getting used to but after a nice meal and some wine something clicks and many western ears suddenly 'get it'. I know that for days after the festival I had tsambouna playing continuously in my head. In a lot of ways it reminds me of the Master Musicians of Joujouka, the centuries old Moroccan group that was discovered by Brian Jones in the late sixties. This group had healing properties attributed to their ancient music and it is said that people who were complete lunatics calmed down when they were exposed to the music. This is not to suggest that the tsambouna music of Kea will heal you if you are crazy. But ancient music has a way of affecting us spiritually and psychologically if we allow it. So what does the Tsambouna sound like? I am glad you asked. These are from the festival. As I mentioned before the sound takes getting used to but if you play these a few hundred times, before you know it you will be hearing it in your sleep.